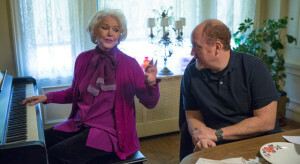 “The Elevator” is a unique entry on this list because it is not a feature film, but rather six consecutive episodes of Louis C.K.’s great, boundary-pushing television comedy, Louie. As the time came to take the final snapshot of 2014, however, I could not rightfully deny these six episodes their collective right to be called one of the year’s funniest, most candidly sad, and exhilarating motion pictures. Do not let the credits at the end of each segment fool you. Louis C.K.’s “The Elevator” is a bona fide movie and one of the finest relationship dramedies I have seen in quite some time. “The Elevator” begins with a child’s frightened scream and ends with two grown-ups sitting in bittersweet silence in a Hungarian restaurant. In between, it finds a wealth of ways to explore the folly of human beings strivng to hear one another and be heard. The opening scream belongs to Louie’s 10-year-old daughter, Jane, who snaps awake from a nightmare. Louie runs into comfort her and assure her she is now awake, but she has her own take on what is going on. She concludes she has woken from a bad dream into another nicer dream. The new “dream” is so nice that she decides she is still experiencing it the next day, as she prepares to board the New York City subway system with her father and older sister, Lily. As children of divorce, Lily and Jane are making their regular journey between households to spend a few days with their mother, Janet, a brusque, witty, and whip-smart woman who regards her ex-husband with equal measures of strained protectiveness and impatience. Jane, wishing to fully explore the possibilities of being in a dream New York City, darts off the subway platform right before the train exits the station, leaving her sister and panicked father on the departing car. When Louie finally recovers Jane unscathed and drops his daughters off with their mother, it is a chance for us to see how they speak with one another and the subtle ways the divorced parents mishear one another. In the coming days, as Jane starts to get in trouble at her elementary school, the cautious truce between them will be tested as they are forced to actively parent in a way they have not had to do for some years. This opening is an almost tangential, and yet wholly connected, vignette in what becomes a psychologically rich look at miscommunication, relationships, and what it means to be both a parent and a flailing human being. As Louie and Janet continually lose and regain their conversational balance, the new boyfriend, Patrick, may have the best approach. He listens, observes the dynamics, and says only what he needs to in order to calm the situation. From the outset, “The Elevator” is a quietly complex dance of human interaction, and all before Louie gets to the fated elevator. 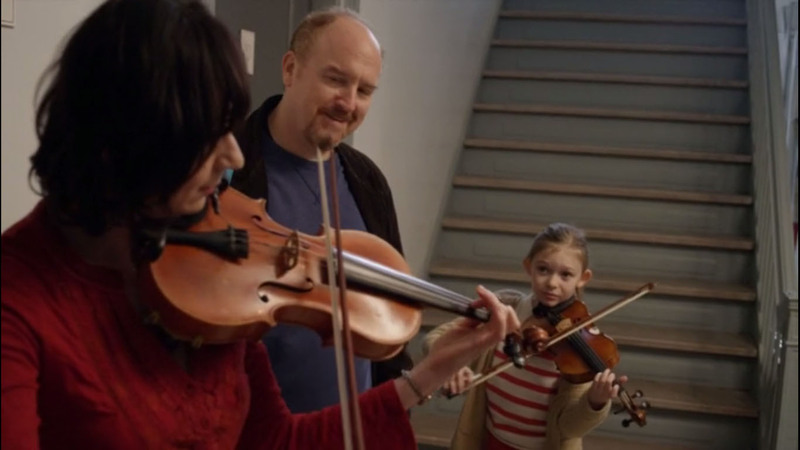 The titular elevator, a handy metaphor for the film’s themes of self-imposed isolation, brings two perfect strangers careening into Louie’s universe of characters. Coming home one day to his New York City apartment, Louie attempts to use the elevator and finds it has broken down. Inside of it, crying out for help, is an elderly woman. Her name is Ivanka, but we will not learn it almost an hour when Louie finally realizes he does not know it. We can miss a lot of even the most basic information if we do not bother to talk to the people around us, be they neighbors, daughters, or spouses. Ivanka is a Hungarian woman in her late 70’s. When she asks for Louie’s help, he stammers that he does not know how to get her out of her predicament. She understands that, but that wasn’t her question. “Can you help me?,” she reiterates. She needs him to fetch her medication from her apartment upstairs. While there, Louie finds a middle-aged woman asleep on couch, who turns out to be Ivanka’s niece, Amia. When he attempts to wake her so she can keep her aunt company in her lonely predicament, Amia panics, curses at Louie in Hungarian and justifiably tries to batter him of out of the apartment. When she realizes her misunderstanding, she goes up to his apartment to apologize with a fruit tart. Over the course of six episodes, Louie and Amia will begin a tentative, fumbling, and finally ethereal relationship, in which they come to care deeply for each other. However, they must confront an immense challenge: neither one speaks the other’s language. Complicating matters further, Louie eventually learns that Amia must return to Hungary in a month to reunite with her son. They must both weigh the ecstasy of developing feelings for a new person against the finality that hangs over it all. In the background of all that, Louie and Janet must figure out what to do with Jane, who has now been sent home from school for accosting a yard duty. Casting a shadow over that is the memory of their own separation. And looming over everything, in the film’s most surrealistic touch, is the giant hurricane heading for the City, a reminder of how small the stakes of human connection are when set against the world’s catastrophes. Having now seen “The Elevator” a second and third time, it is apparent to me that Louis C.K., maybe the most gifted comedian of the 21st century, is more than just an able and imaginative funnyman making a droll and keenly observant show. 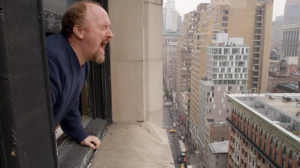 Of course, the pairing of boldly absurdist humor and sweet, humane insights would already be more than enough for me to recommend Louie as a terrific piece of short-form television. But I am not writing an episode review, or a show review. I am writing a film review. And, my goodness, in grouping these six episodes, Louis C.K. has thrown down the gauntlet and made one lovely, uproarious, and sad film. With a strong eye for both the multicultural dreamland and the agitated human sprawl that is New York City, and a fixation on funny, fallible urbanites bouncing into and out of each others’ lives, Louis C.K. continues to demonstrate he has the talent to honor and even transcend the legacy of vintage Woody Allen. They share a sense of humor that is tinted with melancholy and a beating heart whose cynicism never tips over into misanthropy. If anything, C.K. is a healthier, more generous human observer than Allen ever was. Where Allen often played into the role of an intellectual neurotic who could barely stand to look at his fellow man, C.K.’s often ruthless observations of human folly never allow him to pretend that he is above the fray. He is curious, bemused, and irked by this poignant, frustrating farce we have all been sentenced to live out together. Because each segment is its own self-contained episode, as well as a sequence in the larger story, there is a remarkable wealth of detail in just over two hours. “The Elevator” is positively brimming with character and incident. It is almost novelistic in its focus on people and conversations. C.K. is able to juggle a vast ensemble and blend their voices into the themes of his piece. There is scene after scene of fantastic dialogue between Louie and the main characters, from Janet and Jane, to Ivanka and Amia. American national treasure Ellen Burstyn is relaxed, lovely, and funny as Ivanka. The sweetly awkward scenes between Louie and Amia reinforce the theme of how hard and rewarding it is to connect, while always foregrounding the sweetness of the romance first. Even smaller characters who have been a part of the show’s universe in the past take their brief moment on stage to deepen the humor and pathos of the piece. Pamela, the mostly reluctant object of C.K.’s affection, returns from taking her son to Spain and suddenly wants to pursue a relationship. A surly doctor, played to hilarious effect by Charles Grodin, reminds C.K. of how unimportant his relationship dilemma is in the grand scheme of legitimate human tragedy. Louie’s chuckleheaded older brother turns up for a comfortably fraternal squabble over smart phone expertise. In a beautiful, sad flashback, comedian Connor O’Malley delivers an uncannily accurate portrait of the young Louie at the moment he and Janet realized they should divorce. Perhaps best of all, comedian Todd Barry turns up for a single scene to give a fantastic soliloquy in defense of pigheaded selfishness. Barry details a typical day as a single man unafraid to embrace his own brazen pettiness. Todd Barry is a self-possessed misanthrope, never too shy or self-effacing to ask the world to grant him one more perk, to press for another favor, or to force the owner of a rundown comedy club to spell his name right on the dressing room door. Barry’s monologue is a hilarious hosanna to the simple, self-interested joys of the bachelor lifestyle, and a wonderful, blunt counter-point to the film’s yearning tapestry of human beings struggling to find solace in one another. If you have the constitution for it, it may just be a whole lot easier to be Todd Barry, wiping your hands of the whole human comedy and enjoying life one stolen nap or free donut at a time. 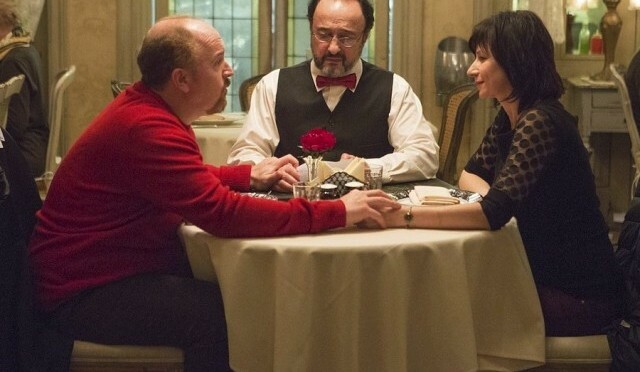 Louie may be a comedy, but “The Elevator” finds Louis C.K. using sharp humor to enrich a deep, personal drama. It is tremendously exciting how rapidly he has matured as an editor, writer, and director of his own work. “The Elevator” is the work of an artist who is hungry to tell stories, and if that occasionally makes it feel overstuffed with ideas, that is just the kind of problem an evolving auteur wants to have. Every scene provides a new observation on the way human signals get crossed. There is a wonderful moment when young Jane meets Amia for the first time and Louie learns that his young daughter knows more Hungarian than he does. It is a startling and humbling revelation for Louie. Sometimes even the people we are charged with raising find ways to grow and develop that we knew nothing about. Seeing that Jane is coming from a violin lesson, Amia enters her apartment and emerges with a violin of her own. And they stand in a New York City stairwell and play. For a full minute, the two women, one young and one middle-aged, connect ineffably with one another through music, as Louie looks on tongue-tied, with a mixture of pride, wonder, and bashful longing. This humble moment is the unspoken hope flickering in the heart of every lonely soul in New York City. All the walls have crumbled. True communication is so rare that there is value in just being a witness to it. When we find ourselves dumbstruck, that may be the universe telling us to start listening. Very glad to see some one recognize this piece for what the work of undeniably craftsmanship it is. Though it is unmistakably well crafted, I did personally find more enjoyment from another episodic story in Louie’s latest season; “In The Woods” is another story told over multiple episodes (though, only two, compared to The Elevator’s six) and explores the relationship through parents with troubled pasts and their kids, who inherit similarly rebellious attitudes. It isn’t nearly as profound cinematically as The Elevator, but it is definitely a strong piece of storytelling, and if nothing else, another great example of Louis CK’s terrifically sober understanding of human nature. I loved Into the Woods! It so much reminded me of being that age and going through things like that (not necessarily larceny) but just… childhood is over.